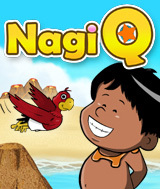 NagiQ is an original and family-friendly word game. You have to help Nagi to recover some mystic letters scattered throughout his world's islands. For playing, think of words in English, write them with the computer's keyboard or the onscreen keyboard, and place them on the board. When placing your word, try to include the mystic letters which are on the board. You'll win the game when you have included all of the mystic letters in your words. Challenge and hours of gameplay are guaranteed as the game comprises 125 levels of brain fitness!